Slide into the lift and take off for the summit of the city! Once inside, you'll immediately notice that three of the walls are made of glass. 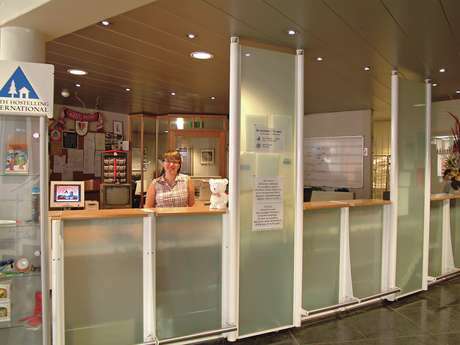 This is ideal to examine the centre of the building from as close as possible! Two-thirds of the way up, you'll be amazed by the scene that unravels below you. The 360° panorama reveals its most beautiful assets before your very eyes. On the right, behind the Saint Callixtus chapel (the oldest building in Mons), you'll glimpse the roofs and turrets of the prestigious Saint Waltrude Collegiate Church, and not far from there, the Grand-Place. You'll also notice how green the landscape is, with its wooded hills such as Mount Panisel and Mount Héribus, as well as the many slag heaps, the remnants of a once prosperous industrial activity. Also visible are the Quévy and Estinnes wind farms (not surprising, since the latter has the tallest wind turbines in Belgium). On the left, it's the Strépy-Thieu boat lift that stands out. And rightly so! It's the largest boat lift in the world! But more than just a pretty panoramic view, a veritable vertical museum awaits you. So, onwards with the descent, via the stairs this time, to reveal the many secrets of the Belfry, floor by floor. You therefore descend one floor (guaranteed thrill with the view below - those with vertigo won't forget this!) to get better acquainted with this emblematic building. Geography, architecture, history - I could go on - all subjects that play a role in the Belfry. Anecdotes (we can't get enough of them!) and the use of new technologies will bring life and energy to the visit. In addition to the traditional signs, two interactive tables recount the history of the site in a fun way. What's more, they're connected to the bell-ringer's cabin, which means... you'll have a front-row seat for the show! And that's not all! You'll also be able to admire the projection of visuals onto this great tower, or cast your eye over the numerous objects in the window, which embody the attachment of the people of Mons to their sacred Belfry. You can really see the monument's value for the locals, and how lucky they are to still be able to exhibit such relics of the past. Now that you know a little more about the beloved Belfry, you'll have the privilege of going six metres higher, to the very middle of the carillon. A unique opportunity to examine the inner workings of the clock, through the four glass dials. If you look up towards the ceiling, you'll be able to see the splendid frame, as well as a number of 12th-century bells, a reminder of the key role of the carillon at the time. If you opted for the guided tour, you'll even be able to climb up to the drum! 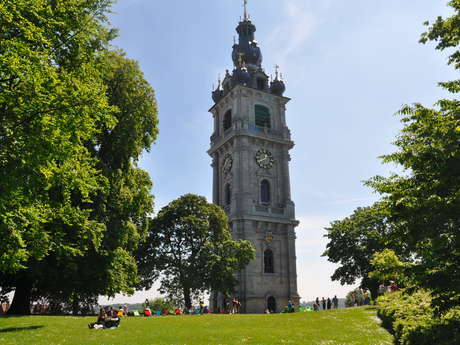 You'll also have another chance to admire the panoramic view of Mons and the region! After effort comes relaxation... music to your ears in Mons! Accessible with the Mons Card!